Hanoi is a swirl of sweet chaos. Motorbikes dart through the streets like schools of buzzing fish. Steam, smoke, and alluring aromas pour out of restaurants and onto the sidewalks. 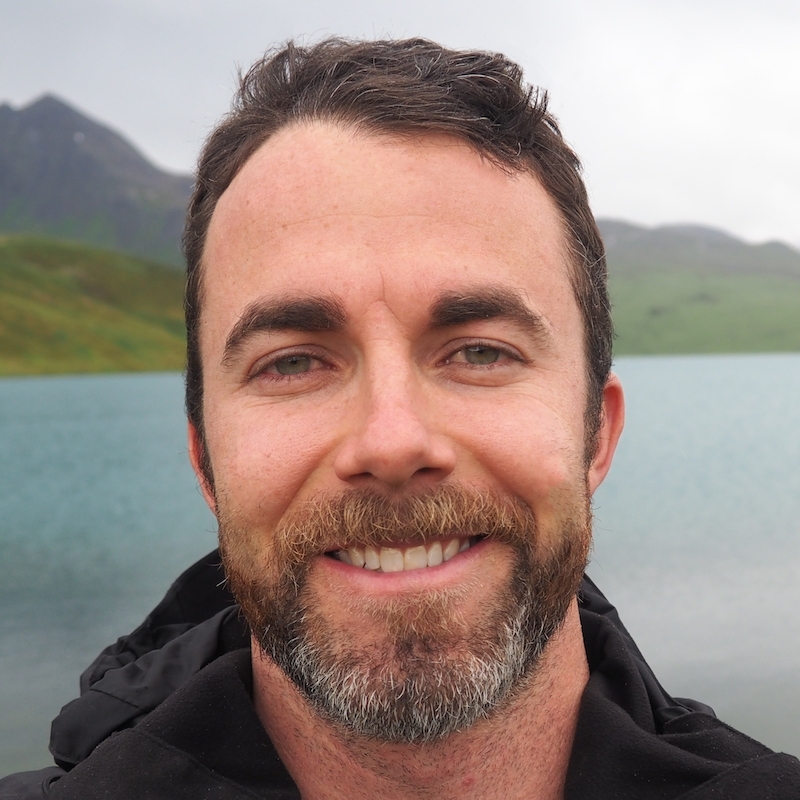 Art, music, and memories of war reverberate everywhere, and I felt it all the moment my boots hit pavement. Exploring Hanoi on a budget is surprisingly easy. Let me share what I learned about maximizing time and money in this vibrant city, the cultural heart of Vietnam. If you let it in, the beautiful chaos within Hanoi will win you over and lure you back. Hanoi is a dense, sprawling city of over 7.5 million people, and one of Southeast Asia’s major travel hubs. With more than 40 airlines and numerous buses and trains leading into it, Hanoi is easy to reach. 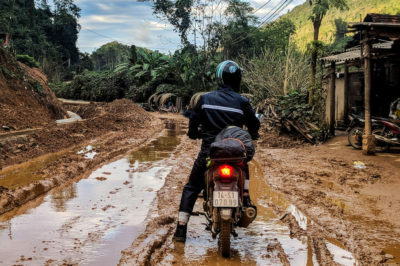 First things first: you’ll probably need a visa to enter Vietnam. Citizens of certain countries can enter the country for up to 30 days without a visa, so do your research and plan accordingly. Check here to see if your country is on the list. Hanoi’s Noi Bai Airport is about 45 kilometers (28 miles) from the city center, so you have three basic options for transport – a city bus, a shared shuttle, or a taxi. Once you leave the Arrivals area of the airport, walk past the taxis to the second island where the busses and shuttles pick up. Keep to the left and take the #86 bus for a 30-minute ride that will drop you off in the center of Hanoi, within walking distance of the Old Quarter’s main hotels and hostels. The bus is clean, comfortable and has onboard WiFi. Taking the 86 bus is by far the cheapest option, which is why I recommend it over a shuttle or taxi. The shuttles to Hanoi are hard to miss. They’re located on the second island directly next to the city bus stop and will drop you off in front of your hostel or hotel. However, shuttles are eight times the price of the city bus and generally won’t leave the airport until all the seats are filled. If you’re arriving late at night, traveling with a small group, or just want to get to your lodging quickly, then grabbing a taxi into Hanoi is your best bet, but at a far greater price. Be sure to finalize the trip fare before you put your luggage in the taxi, and be prepared to negotiate. 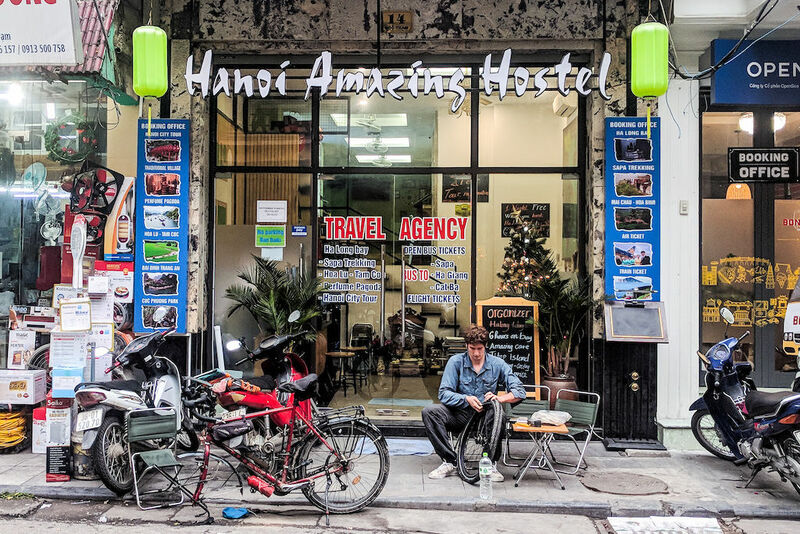 The Hanoi Amazing Hostel is an excellent choice for your Old Quarter basecamp. In all ways, it’s one of the best hostels I’ve ever stayed in. The beds here are soft and comfortable and have curtains for your privacy. The internet is lightning fast and reliable. Free and delicious breakfasts are served daily from 6:30 – 9:30 AM. Plus, the Hanoi Amazing Hostel is centrally located and has a very friendly and helpful staff. Satisfy your morbid curiosity and catch a peek of one of the 20th Century’s best-known political leaders. Ho Chi Minh was Vietnam’s president from 1945 – 1969 and is remembered for helping his country gain independence from France and leading the charge against the U.S. during the early stages of the American War in Vietnam. Following his death in 1969, Minh’s body was embalmed and put on display in a glass case for public viewing. Since 1975, long lines of visitors have entered the mausoleum daily to catch a glimpse of his body. The mausoleum closes for a couple months every fall, while Minh’s body is taken to Russia for meticulous re-embalming and other maintenance. 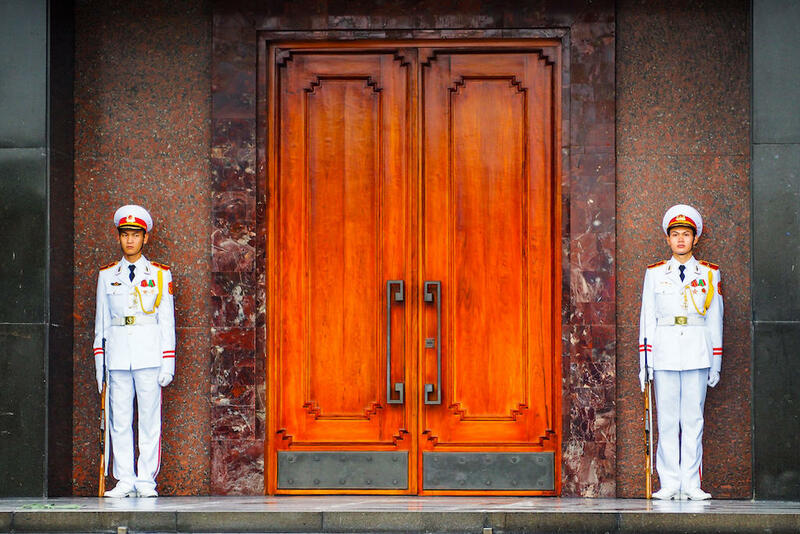 The Vietnamese take the mausoleum very seriously, so conservative dress is required. Shorts, tank tops, and sleeveless shirts are against the dress code, and will get you turned away at the entrance. Cameras and bags are also prohibited. Location: Anywhere along the train tracks running through town. 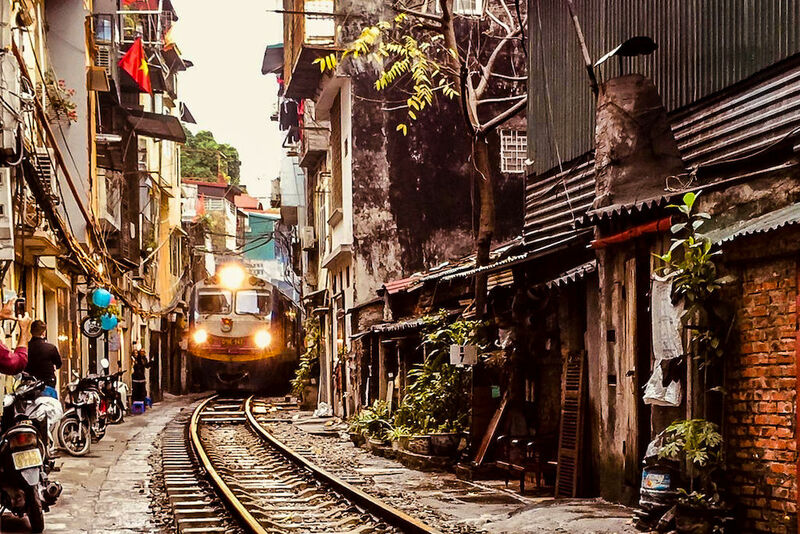 Several times a day, a large, clunky train destined for Ho Chi Minh City roars through the heart of Hanoi, just inches away from the shops and homes that line its tracks. As a train draws close, people retreat inside to avoid the deafening horn blasts that herald the metal beast as it grinds through town. As I wandered down the tracks looking for a place to view the spectacle, the welcoming staff at 65 Railway Coffee made me feel at home. We chatted and laughed as I drank Hanoi Beer and awaited the train’s booming arrival. Take a walk down this peaceful stretch of sidewalk and soak in a full block of street art murals that offer candid glimpses into Vietnamese culture. The artwork, commissioned by the city of Hanoi, captures the country’s turbulent past and raises important questions about the future of Vietnam as a whole. Don’t forget to read the plaques by each of the 19 pieces of art. They reveal the artist’s message for each mural and explain the complex and dynamic culture that gave birth to these images. While the murals on this block aren’t quite as wild or free-spirited as in more street art-centric destinations, they do offer a thoughtful and creative dive into Hanoi’s rich and complicated history. Hoa Lo Prison (a.k.a. the ‘Hanoi Hilton’), was originally used by French colonists to hold native political prisoners before Vietnam gained its independence in 1945. The prison dates from the late 1800s and captures the dismal living conditions of past captives while telling the story of how Vietnam eventually gained independence from the colonial powers. Decades later, during the American War in Vietnam, Hoa Lo was used to hold captured U.S. prisoners for the duration of the conflict. John McCain, the prison’s most famous American prisoner, spent five-and-a-half years in confinement, enduring brutal torture and harrowing living conditions until his release in 1973. Hoa Lo made my heart sink and gave me a somber look back into the turbulent recent history of Hanoi, a city that only started allowing American tourists to visit the year that I was born. If you’re looking for a break from the dizzying and draining pace of city life, Union Park (Công viên Thống Nhất) is the place to catch some fresh air and refresh your psyche. For a small entrance fee, you can escape the motorbike fumes and noisy streets for as long as you need. Sit on a bench and people watch, go for a jog, watch the locals dance in groups, or take a nap under a tree – the opportunities to relax and recharge are endless. When I was strolling through the park, a group of teenagers invited my into their game of Jianzi. I reluctantly obliged and spent the next two hours laughing and kicking around a weathered shuttlecock as day gave way to night. Twisted metal scraps of fallen planes, tanks, bombers, cannons, and other war relics rest solemnly outside the Vietnam Military History Museum. They are stark reminders of a brutal war and the carnage left in its wake. Inside the museum is a more detailed dive into the history of the American War in Vietnam and how the country changed as a result. Though devastating and tragic, the war is central to the history of modern Hanoi and a reminder of the resilience of the Vietnamese people. Note: The museum closes daily from 11:30 AM – 1:00 PM. I wandered into the impressive outside array of exhibits during this time, so my experience was free. In Hanoi, the streets are bustling and the opportunities are abundant. Walking the city without a map and no particular destination in mind will reveal the city’s wonder amidst its chaos. 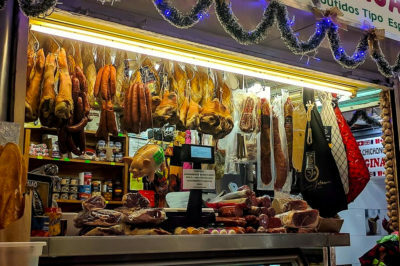 Poke your head into crowded shops and restaurants, chat with locals, walk down intriguing alleys, and weave in and out of the noisy river of motorbikes. I spent my first two days in Hanoi meandering the streets aimlessly as I soaked in the sensations and let my instinct lead the way. Hanoi rewarded my curiosity with fascinating culture and delicious food at every turn. I’ve never been much of a coffee drinker, but Hanoi’s strong signature brew has changed that. 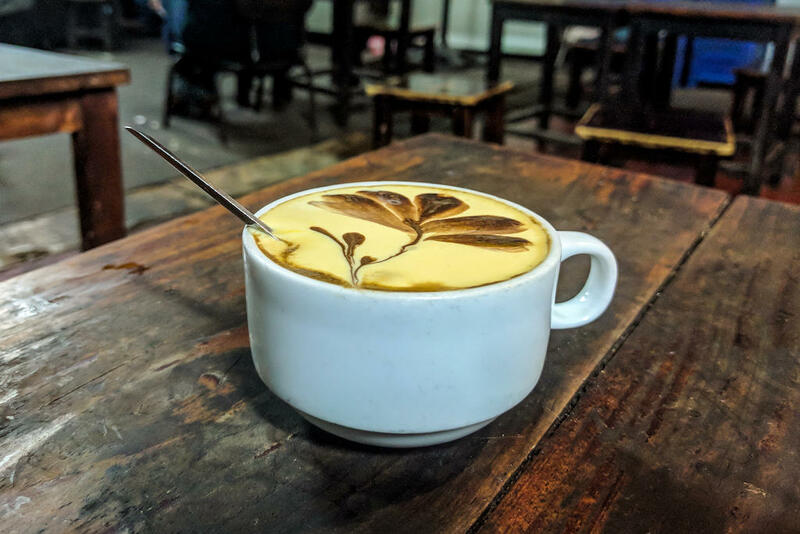 Vietnamese coffee is complex, concentrated and bold, and Hanoi’s famous egg coffee takes the flavor to an even higher level. Eggs, sugar, and condensed milk are whipped into a custardy foam that sits atop a steaming shot of rich coffee. You really must try it. Cafe Dinh, a true hidden gem, is where you’ll find some of the best egg coffee in town. It’s on the second floor of an aging building, accessed by stairs sandwiched between congested clothing stores. The vibe of the place is funky and bohemian, and the coffee is sensational. I savored the brew on three separate occasions in the middle of a lively, high-energy crowd each time. I’ve eaten too much delicious pho in Hanoi to pick a single favorite, so here’s my advice: walk the streets, follow your stomach, and eat as much pho as you can handle. It’s cheap, quick, and the staple food of Vietnamese people, so why not eat it obsessively? If there’s anywhere in the world to drown yourself in pho, Hanoi is the deep end of that pool. Remember when Barack Obama and Anthony Bourdain ate a meal together in Vietnam? That was in Hanoi, at a restaurant called Bún chả Hương Liên, where the food is legendary. 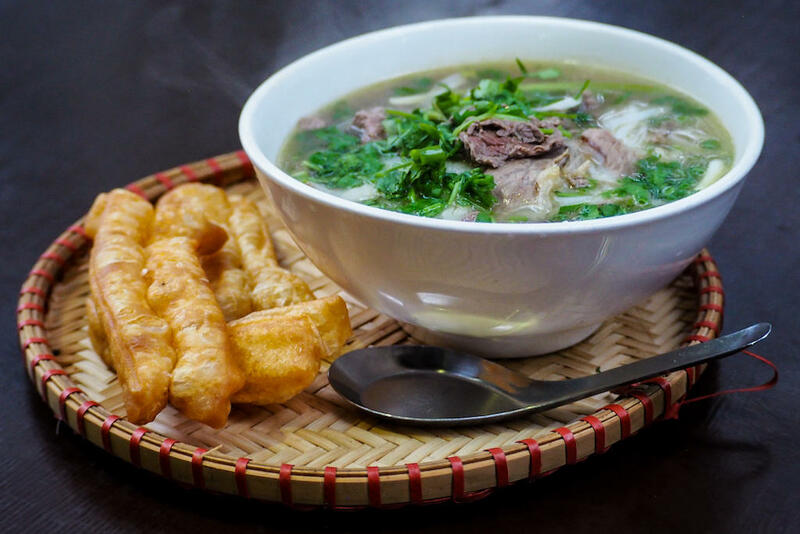 The restaurant is known for bun cha, a beautiful pile of Vietnamese rice noodles used for dipping into a sweet fish sauce, with grilled pork patties and fresh herbs. The table where Obama and Bourdain shared their meal is now enshrined in a glass case on the second floor. Maybe you’ll find yourself a seat near that table, staring at those preserved place settings with a quiet sense of awe, as I did. Order the Obama Combo: a serving of fresh bun cha, a seafood spring roll, and a Hanoi Beer. In the mood for a late night snack? Look no further than the fresh baked coffee buns at King Roti. Choose one of the four flavors — chocolate, matcha, vanilla, or salty cheese — and surrender to your sweet tooth. The buns are pulled hot out of the oven and pair perfectly with Vietnamese coffee. The crunchy shell and warm, doughy interior are worth the trip every single time. Since 2007, Binh Minh Jazz Club has offered up some of the best live music in Hanoi. Every night, the city’s most talented jazz musicians converge to jam and fill the cozy bar with their spirited music. Order a cocktail and grab a table up front. There’s no admission charge, but the price of beverages skyrockets after 7 PM to cover the cost of entertainment. The atmosphere is laid-back, unpretentious, and the music starts at 9 PM. Expect to spend: 25,000 VND ($1.00 US) for a beer during happy hour and 80,000 VND ($3.50 US) after 7:00, when happy hour ends. Enjoy Hanoi on a Budget! 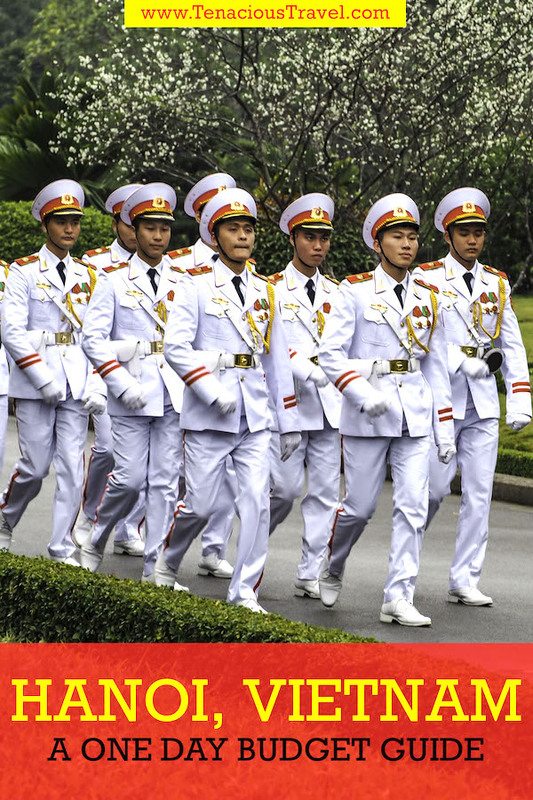 Hanoi’s captivating culture and rich history create a burning energy that keeps the city moving forward. The flavors are enticing and the opportunities are boundless. To walk the lively streets here is to invigorate your senses and expand your soul. While my guide focuses on how to have a delicious, exciting, and affordable time in Vietnam’s historic capital city, I have a feeling the inspiring and chaotic streets of Hanoi might lead you in your own unique direction. Do you have any budget recommendations for Hanoi? Any questions about the food, culture, or people of Vietnam? Let me know by leaving some feedback in the comments below! Great article..thank you. I’ll be booking my flight this weekend coming. I want that coffee .. 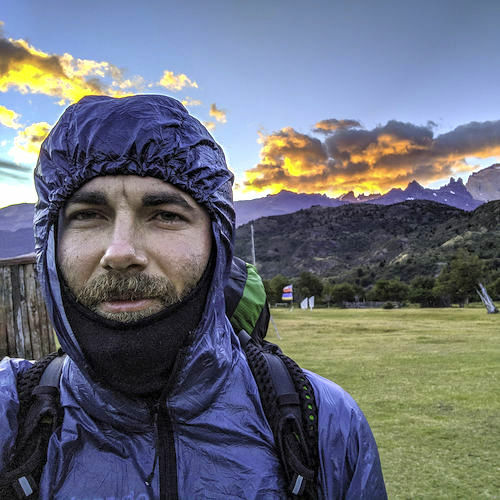 Egg coffee, pho, and fake North Face gear… I could live on those three things for the rest of my life. Missing Vietnam already. Enjoyed the article – but John McCain and “brutal torture”? The US legacy in this part of the world is not too glorious! I agree… the legacy the U.S. left behind in Vietnam is definitely not glorious. McCain did endure brutal torture in Vietnam, but because he was part of the American invasion of their country. The Vietnamese paint the picture that the American POWs were very well taken care of, but obviously that was not the case. U.S. and Vietnam have very different accounts of the war and I can see it from both sides. Fascinating and sad part of human history. Thank you so much for the feedback. It was an easy article to put together because Hanoi is truly one of the most exciting cities I’ve ever visited! Have you been? If so, what other recommendations do you have?